Conversation Hearts are an iconic Valentine’s Day Treat. So why not try and make a rice krispie treat version? 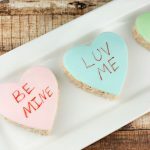 Making Conversation Heart Rice Krispie Treats made a cute and fun treat, perfect for Valentine’s Day! I decided to take the cute little sayings and place them on my best rice krispie treat recipe. *Full recipe in printable card below. After making your pan of the best rice krispie treats, choose your heart shaped cookie cutter. 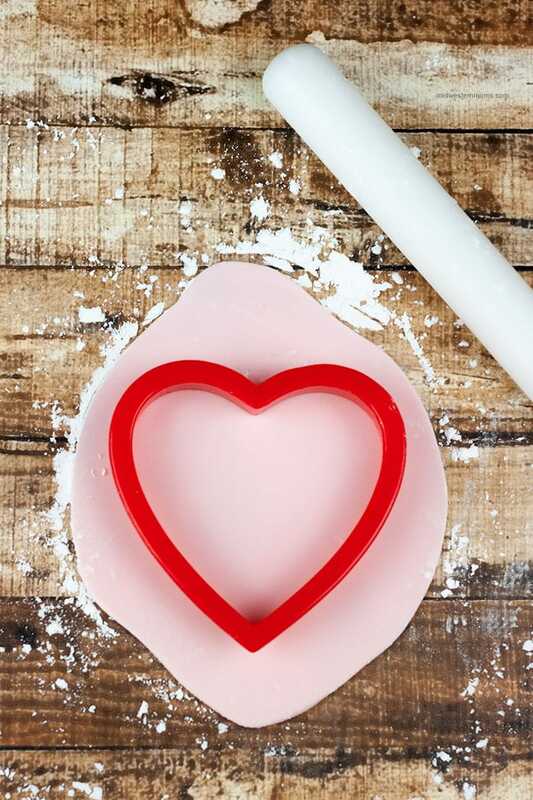 The size of cookie cutter will determine how many hearts you will get from your pan. After cutting out your hearts, it is time to work on giving the hearts their pastel colors. 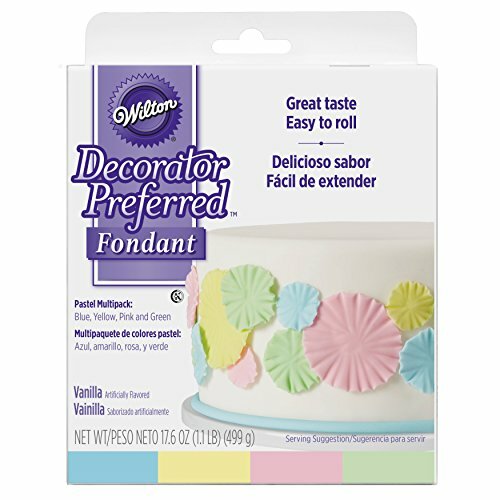 I used Wilton Pastel Fondant. Tip: Knead the fondant for a few minutes to soften it up before trying to roll it out. Dust your flat surface with powdered sugar. 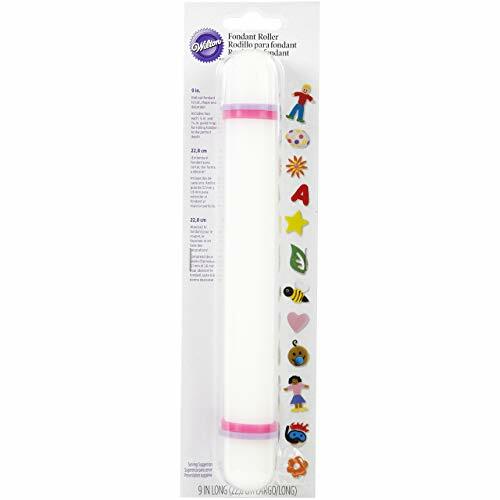 Using either a fondant roller or a rolling pin, roll the fondant out thinly. Then using the same heart-shaped cookie cutter, cut out a heart. Usually, I make my own buttercream, but this time, I opted for store bought. Either one will work for this recipe, but you do not need much. Spread a thin layer of buttercream over the top of the rice krispie treats. Then place the fondant heart on top. 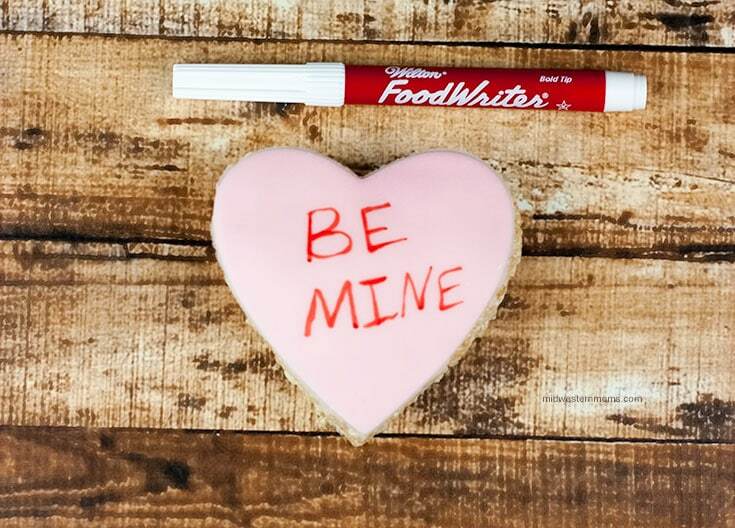 Once the fondant has dried a bit, use a food writer pen to write your messages! Use the fun sayings from the conversation hearts. Also, use a few different colors of fondant for the hearts. 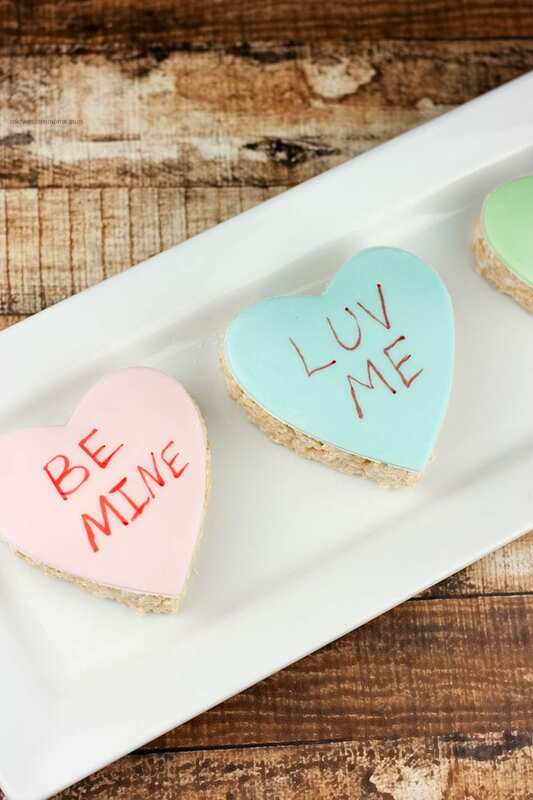 Perfect treats for Valentine’s Day! 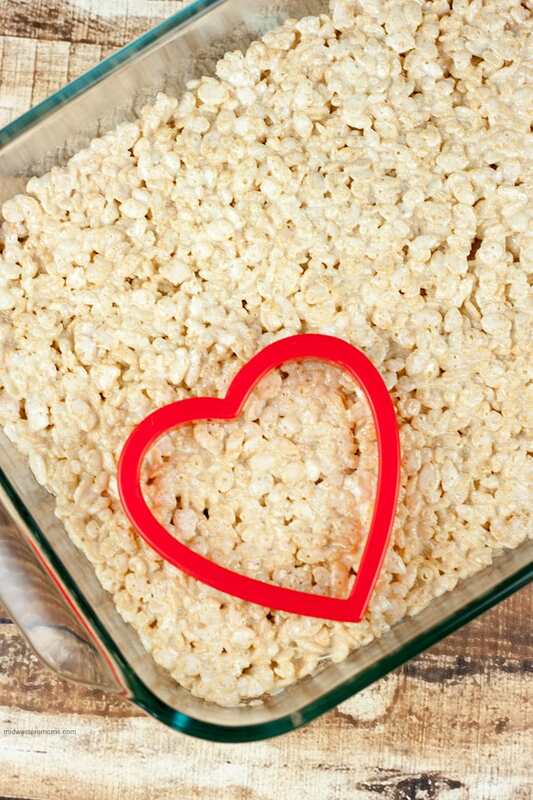 Conversation heart rice krispie treats are the best rice krispies treats for Valentine’s Day! Allow the treats to fully cool and set up. 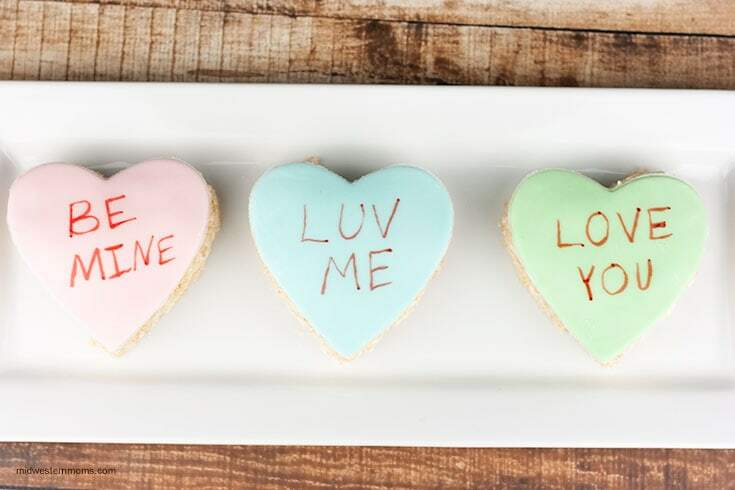 Using a heart shaped cookie cutter, cut out heart shaped treats and set aside. Sprinkle a flat surface with powdered sugar. After kneading the fondant, roll it out thinly on the powdered sugar surface. Using the same cookie cutter, cut out a hear shape. Spread a thin layer on top of the rice krispie treat. Lay the fondant heart over the rice krispie treat and press down gently to put it in place. Allow to harden a bit before writing on the hearts with the food writer. 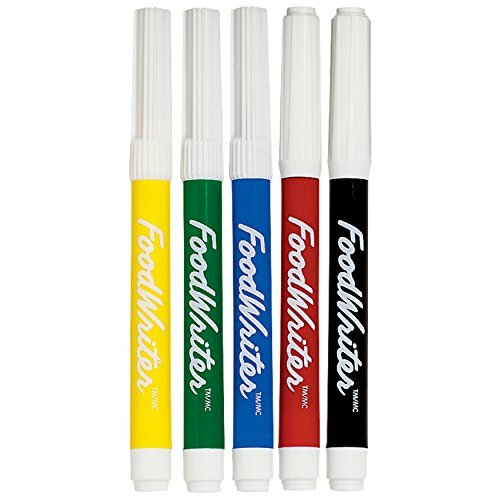 (I used a red one).